TUMEKE! : Campbell Live beats TVOne for first time - congratulations John! 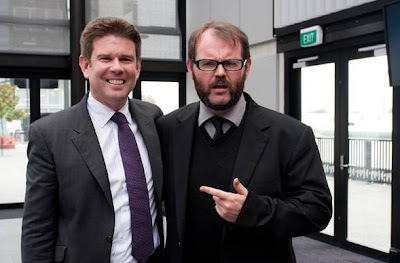 Campbell Live beats TVOne for first time - congratulations John! Campbell Live last night beat the TV One 7pm show Seven Sharp overall audience for the first time since Campbell Live began in 2005. It is also the first time TV3 has ever beaten TV One in the 7pm weekday slot since TV3 began in November 1989. Seven Sharp took another hit in the ratings on Tuesday night after a short recovery in Monday's show, according to overnight ratings from Nielsen TAM. The overnight ratings are significant, with Seven Sharp last night providing the most accomplished performance so far. Fewer people would have seen the signs of improvement on the show. The audience for people aged over five years is an indicator of the total audience, which is dominated by TV One. Last night's ratings illustrate the danger that older Seven Sharp's viewers - carried over by its predecessor, Close Up - are migrating to Campbell Live. Heartfelt congratulations to John Campbell, Mark Jennings and the entire Campbell Live team! Well done guys, what an incredible achievement. After all those years, fighting the good fight to bring real journalism to the 7pm slot instead of the watered down crap TVNZ served up. The irony is that TVNZ is supposed to be our public broadcaster and is supposed to be the fourth estate holding the powerful to account, where as TV3 are the private company only focused on making a buck. Campbell Live has fought off @ Seven which in 2010 was going to be the cost cutting effort implemented by a debt laden Ironbridge, there were rumors of Campbell Live being on the chopping block and all that nonsense over John wearing a tie. Well look who is laughing now? By realizing that we are in a deep, deep recession and understanding that when NZers can't afford to be consumers they want to be citizens, Campbell Live's mix of crusading journalism and genuine attempt at accountability has finally paid off and all can hold their heads high as the best AND most popular current affairs program in NZ. It's a god damned shame the TV Awards just got scrapped, because sweet zombie Jesus, Campbell Live would have romped home. The hate crime against public broadcasting that is Seven Sharp is now hemorrhaging. Oh how Mark Sainsbury must be laughing his great shaggy arse off. I've explained that Seven Sharp is a frankenstein monster created by marketing rather than news, and have listed the billion reasons why it was never going to work, and they are all occurring in rapid succession. Why TVNZ didn't heed the warning of the @ Seven fiasco attempted by TV3 in 2010 is utterly beyond me. TVNZ marketing wanted Seven Sharp so that the advertising overlap from Shortland Street could find a home, and they would have expected the older audience to leave, (but not in the numbers they have). TVNZ hoped that the social media element would have brought more younger viewers in which wasn't a completely stupid strategy seeing as a younger demographic do want a current affairs show that deals with their record unemployment, their record poverty and their record debt. Sadly Seven Sharp was never going to be a vehicle for that. Seven Sharp is there to provide a safe, depoliticized advertising space, it isn't about subversively standing up for those on the bottom of the heap and as such is failing abysmally. People will vote with their remote and they are. While Seven Sharp was expecting a dip, they can't have imagined the train wreck it has become. I love how TVNZ news boss Ross Dagan says 'it's too early to judge Seven Sharp'. Mate, how in denial are you? Losing over 200 000 viewers in one week? People have judged Ross and they are damning in their judgment. The winners here are John Campbell, Mark Sainsbury and the current affairs viewing audience who are now watching something far better than Seven Sharp. The losers are every single person involved in Seven Sharp and the National Party. Campbell Live's focus on the real issues rather than the pap of Seven Sharp mean the Government have to deal with a public slowly waking up. Campbell Live deserve a standing ovation. The clock must now be ticking to end Seven Sharp. Campbell Live's focus on the real issues rather than the pap of Seven Sharp mean the Government have to deal with a public slowly waking up. God I hope so. And I don't even believe in god. I stopped watching Seven Sharp as of Tuesday. It really is so, so, so, very bad. It even manages to fail at exactly what it is trying to be. The quality of Seven Sharp is way too high for me, I'm just not used to it, so switched it off. Last evening I watched Seven Sharp for the first time and found it to be the televisual equivalent of flipping through a women's mag at the hairdresser's. I was mildly entertained by it (yes, I admit it!) but it left no lasting impression. Our household has switched from TV1 to TV3 - and that's including the 6PM News, as well as Campbell Live. I hope TVNZ will learn a salient lresson from this - there's only so much crap that viewers will take from advertising-oriented, mindless-pap TV before they have enough and switch to another channel. It's like overloading on sugar. After a while your crave craves something more substantial to consume. TVNZ - time to reappraise your role in our society. In simple words: lift your game! I mute the volume and try to imagine Alison Mau naked . My attitude fits it's IQ .